"La race humaine de Neanderthal ou de Canstadt en Belgique: Recherches ethnographiques sur des ossements humains, d‚couverts dans des depots quaternaires d'une grotte a Spy et determination de leru age geologique." 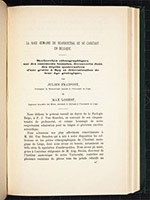 Archives de Biologie, 1887, 7:587-757. Neanderthal man had slipped from the limelight since the 1860s. 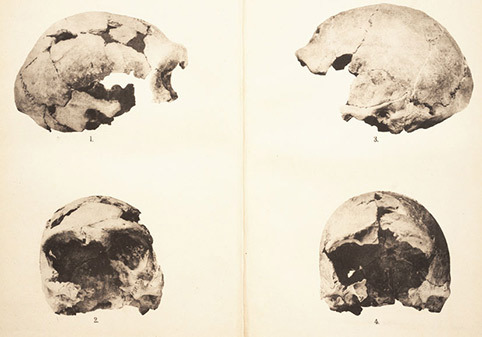 Although it was recognized in 1864 that the Gibraltar skull, found in 1848, was Neanderthal-like, no new specimens had been discovered, and it was still possible to maintain that the original Neanderthal was an abnormality. 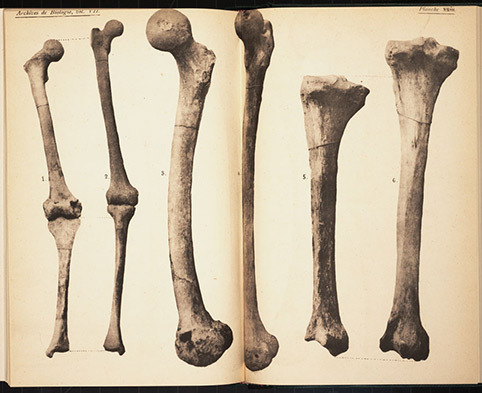 But in 1886 in Belgium, two complete human skeletons were discovered, and they bore an uncanny resemblance to the original Neanderthal, with their prominent brow ridges, shallow sloping foreheads, and hefty bowed thigh bones. It was evident that Neanderthal was a genuine human type. The question now was: where did Neanderthal fit into the overall pattern of human evolution?